the writers here are absolutely correct, these Christians are scorned and not given access to the better jobs, and education, they are not happy doing this, they would rather it be easier for them and their children, but they have no choice. They are making the best they can out of a sad situation and for that I'm glad to see that they have a little hope where they can get it. Have been looking at doing some SEO and bettering the design on my website for a long time, so this website has been very useful. Easy read as well, so thanks! What seems to be ignored in this report is the fact that this is a Christian community that is struggling for survival in an Islamic society. Because of religious discrimination, they are denied access to a proper education and regular jobs. Instead of celebrating the high level of recycling taking place we should be criticizing the government policies which deny these people free access to other avenues of employment. Don't glamorize Garbage City. After visiting last month I'm shocked at the twist that people have chosen to put on what they've seen. "Green" is obviously in vogue, but don't forget that people are literally living in trash - children are crawling in it, people are breathing the results of trash being burned in that neighborhood, the elderly -- if they manage to get that old -- are fumbling through it. The residents aren't making some magical buildings out of discarded water bottles or insulating their homes with cleaned up, reprocessed, recycled materials. The smell, even in winter, when it's only around 70 degrees, will choke you. The fumes burn your eyes. Yes, people are eeking out a living (and don't think it is a high quality of life) by sorting through refuse, but fundamentally this is a landfill where Copic Christians are living. This isn't some idyllic recycling community that is out to save the earth. This is a neighborhood buried in garbage. 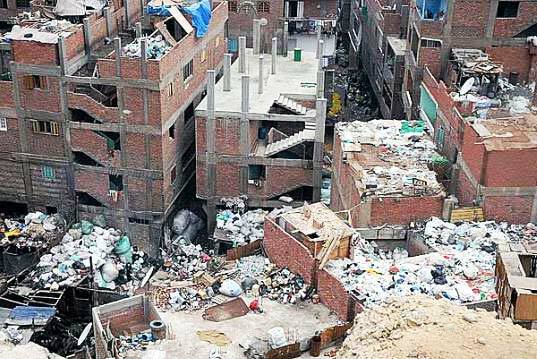 And don't let these stories make you think that the rest of Cairo is clean. 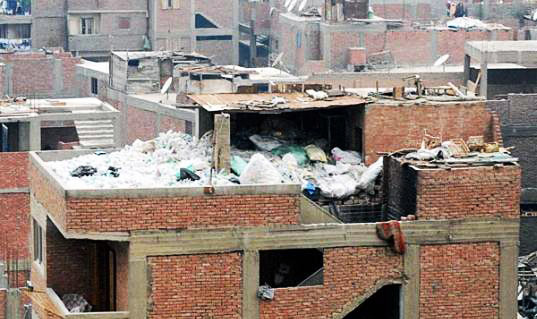 The rest of Cairo is also buried in trash, too. Blame it on consumption? 21 million people in the metro area -- even when they can't afford to consume much -- still generate trash. There is little or no waste management. We would call a neighborhood like this in the US a Superfund site. This is fundamentally about poverty, not about recycling. When looking at other articles related to this story, I, for one, was shocked that some people could call this wasteland sustainable. To call the Zabaleen way of life sustainable or environmentally friendly completely overshadows the flagrant lack of rights these people are living with every day. It saddens me to see people commending the fact that young children are sifting through waste to find recyclables for the sake of their environment. They are not doing this for the environment! Now I'm only assuming this, but it seems to me that the only reason the Zabaleen work in these conditions are to gain whatever meager means of life they can afford. When will people realize that sustainability does not only have to deal with lower carbon emissions and inventive design? I'm honestly frightened when I read that one could even argue that this is sustainable when so many people are suffering. Don't get me wrong, I'm all for sustainability, and being eco-friendly, but sometimes it seems we forget that as humans, we are as integral a part of the environment as the solutions we must create to stop the climate crisis. I wish people would stop drooling over an entire economy based on recycling and how great it is that 90% of the trash is being reused when there is such a blatent disregard of human rights that these people will live with the rest of their life. I don't know what the solution would be for this environmental problem but calling this an acceptable answer is not good enough. Unless we want the rest of the poor throughout the world to live like this in the future, we have to go back to the drawing board and add the people into this equation. That's amazing. It reminds me a little of Wall-E. It's really interesting to see how waste is handled in different places. I wonder how visible this is to other Cairo residents, or if they have a similar experience as the typical American throwing something "away". 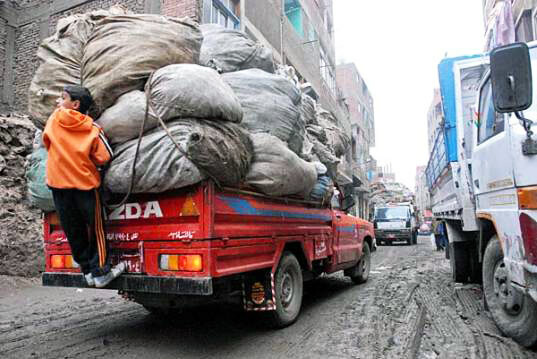 This unbelievable city piled high with trash is a real place called Garbage City, outside of Cairo in Egypt. It's populated by a community of workers called Zabbaleen, who personally collect, sort, reuse, resell or otherwise repurpose Cairo's waste. Recently several photographers have trained their cameras upon the city, and now we see what it would really be like to live in the aftermath of our own consumption.